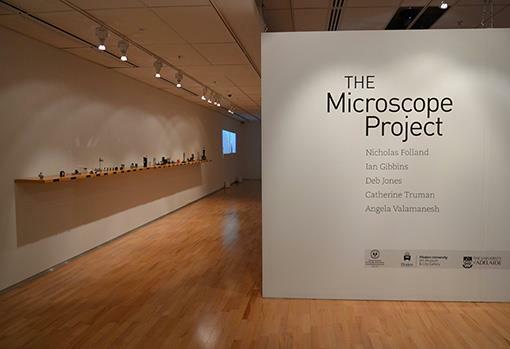 The Microscope Project ran from 26 July to 21 September at the Flinders University City Gallery. The Following article isn’t a review of the exhibition rather it is a response to two publications associated with the exhibition – The Microscope Project (Exhibition Catalogue) and an associated publication The Microscope Project: How Things Work. When I was about 6 or 7 I received a microscope for my birthday. It was a beautiful aqua colour with a black rubber base. If you removed the base there was space for 2 AA batteries which powered a small bulb which shone up into the lens illuminating the slide. The microscope had three levels of magnification, x10, x25 and x50. It came in a wooden box together with a slide kit and a number of ‘sample’ jars. One jar contained a small crab suspended in an orange coloured liquid. I remember taking the crab from the jar and, using the surgical instruments provided, removing a small limb and placing it gently on the glass slide. Turning on the light I fiddled with the angles, changed settings and tried to focus. Suddenly, in an instant, it all came together, the light, the dismembered limb, the fine hairs I could scarcely see with my naked eye. I imagined the crab limb reaching up and dragging me down into an imaginary world within a new looking glass – a world on a slide. It is not surprising that this memory came floating up as I considered the documentation which accompanies The Microscope Project an exhibition which ran at the Flinders University City Gallery, Adelaide from 26 July to 21 September 2014. In 2012 Flinders University decommissioned a number of microscopes and associated tools, equipment and documentation. Under normal circumstances the old equipment would have been thrown into skips and scrapped. The equipment, however, had been the tools of trade for retired neuroscientist and Emeritus Professor of Anatomy at Flinders University, Ian Gibbins. Gibbins is also a poet and electronic musician and, fortunately, this convergence of science and art provided the catalyst for an extraordinary recycling project which saw two scanning electron microscopes, one almost completely disassembled, a number of fluorescence microscopes, and a whole room of ancillary preparatory equipment and spare parts transformed into works of art which both create new objects and texts form now obsolete machinery, while also paying tribute to their past life supporting cutting edge research. While the resulting exhibition has now been taken down, my interest in the project goes beyond the physical display – indeed I never actually saw the exhibition. From Sydney I approached the work through the documentation, a project catalogue titled simply The Microscope Project and a collection of writing (documentation/images/concrete poetry) called How Things Work. I sense myself inverting the microscope, creating a makeshift telescope, to bring the project closer to me – creating a new lens through which to see reconstructed images. First, if an electron beam is powerful enough, it can be focussed in a way analogous to light, using electromagnetic coils rather than glass lenses. Second, the resolution of a microscope is related to the wavelength of the illuminating beam: the shorter the wavelength the better the resolution, which functionally means higher magnification. He then goes on to detail the two electron microscopes which are part of the project. A Siemens ETEC Autoscan SEM probably built in 1974. We learn that this microscope was acquired by Flinders Uni in the mid 1970s, was upgraded using parts from a similar unit that had been decommissioned by the Electron Opitical Centre at the University of Adeliade, and was used mainly to examine “the three dimensional arrangements of the capillaries in gastrointestinal and reproductive tracts”. The second electron microscope, the JEOL JSM – 35 SEM, was built in 1976 and was originally purchased by the Weapons Research Establishment at Salisbury, South Australia. In 1997 it was decommissioned and acquired by Flinders University. It is a more advanced instrument than the Autoscan but, as Gibbins reminds us, it is still “completely analogue in operation”. At Flinders it was used in diverse projects “including basic materials research, testing for defects in contact lens manufacture, and exploring the mechanism leading to to kidney stone formation. Fluorescence occurs when a substance absorbs light of a particular wavelength , and then re-emits it at a different, usually longer, wavelength. The wavelength of light is related to its colour: short wavelengths are violet and blue, mid-wavelengths are green and yellow, long wavelengths are orange and red. Fluorescence microscopes use special arrays of filters to select specific wavelengths of light with a high precision. For example, if green light is absorbed by a fluorescent substance in a specimen, it will appear red when viewed with the appropriate filter combinations. And so we have the LEITZ Ortholux II and the Olympus VANOX. Gibbins tells us, with obvious pride, that “during the 1980s, neuroscientists at Flinders became internationally renowned for their sophisticated use of multi-colour fluorescence microscopy to map functional connections between different types of nerves, especially those communicating between the spinal cord and internal organs”. The fact that these microscopes ended up on the floor of an old eucalyptus distillery in Adelaide’s Inner West rather than a skip in a scrap metal yard is probably a result, as much as anything else, of an Gibbins’ emotional attachment to the microscopes. In what must be a fairly rare event Gibbins was instrumental in setting up a Artist-in-Residence project in the School of Anatomy and Histology at Flinders which saw artist Catherine Truman work alongside Gibbins and his team for three years from 2009. Much of their work involved exploring the “overlapping terrain of art and science in the context of representing and communicating knowledge about the human body to medical students.” (Fiona Salmon ‘Through the Lens: The Microscope Project Up Close’, The Microscope Project 2014, p8). With the decommissioning of the old microscopes Gibbins and Truman saw an opportunity to expand on their earlier work by working with a number of other invited artists to ‘recycle’ and ‘reinterpret’ the microscopes. The team eventually included artists Nicolas Folland, Deb Jones and Angela Valamanesh and writer Melinda Rackham in addition to Gibbins and Truman. The catalogue for The Microscope Project is a fairly conventional exhibition catalogue given its somewhat unconventional subject matter. We have histories of the microscopes, background to the project, essays and artist’s statements. And of course we have the art works. 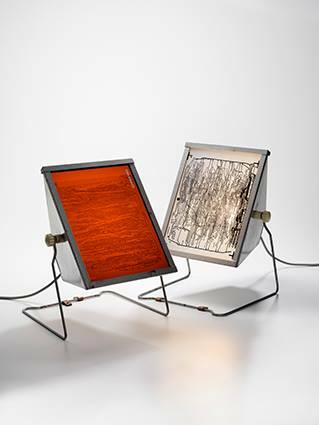 Nicholas Folland takes microscope components and sees “numerous systems of transformations…..chemical, digital/electrical, analogue” and allows the studio environment of the old eucalyptus distillery to inform his thinking. 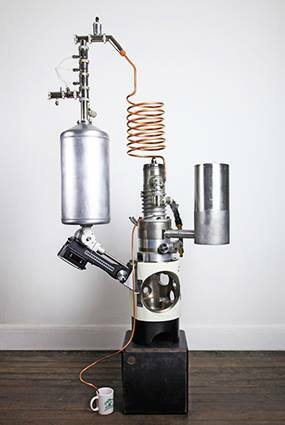 His piece, ‘Popular Science – Still’, brings together the history of the studio space with the history of the components he is working with and a understanding of a microscope as a means to “distill our fermented mash and give us insight into other (im)possible and less complex worlds”. 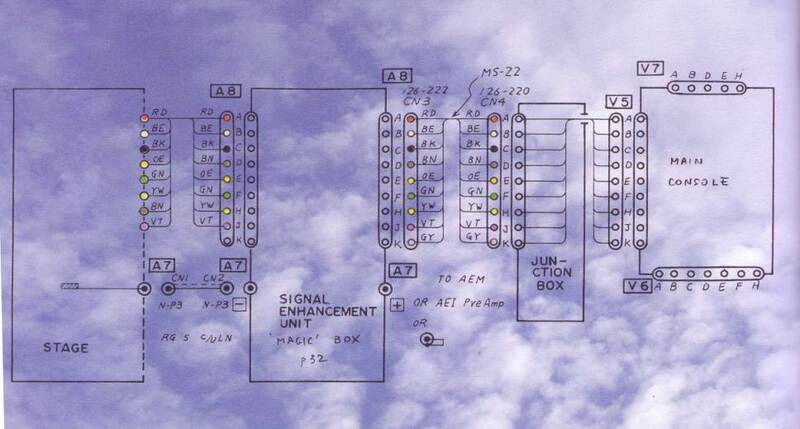 (The Microscope Project P25). Deb Jones plays around with the concept of “light paths selectors” which include the mirrors and polished glass with in the microscopes. 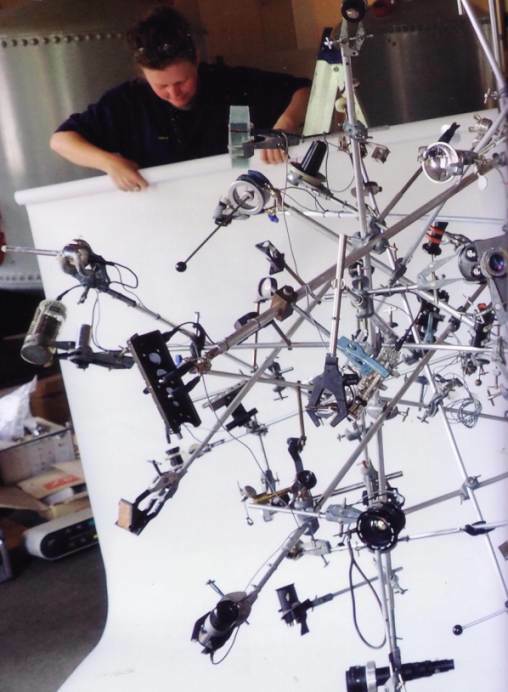 The result is a joint work with Truman and Gibbins, Chandelier, which uses “worn out bosshead and retort clamps” to hold together the mirrors and polished glass and a solo work, Circuit Lamps, which uses the printed circuit boards of the dismembered microscopes to create a set of functional lights. Deb Jones, Catherine Truman and Ian Gibbins. Chandelier (work in progress) mixed media installation. Photograph Catherine Truman. But while the images of the individual artworks represent powerful reworkings of old technology and interesting artistic processes, for me it was the second volume which accompanied the catalogue which captured my imagination. How Things Work reworks and represents the accompanying documentation in a similar way to how the artists reinterpreted the physical computers. Here we have the schematic diagrams and plans, manuals, advertising brochures, catalogues, certification of performance, packing lists and associated documentation – viewed and displayed in new and unique ways. They become artworks and poems in their own right and they result in new pieces of writing as they are reinterpreted through the medium of the exhibition process. 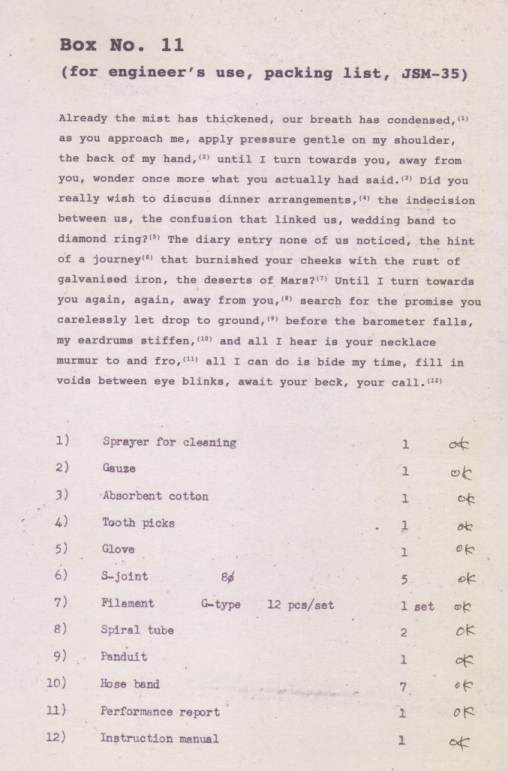 An original checklist becomes a footnote for a piece of writing, typewriter characters on aged paper echo the analogue technology of the microscope – but as with the artwork, what we read has a very different meaning to the original. There are some more traditional visual/concrete poems here as well. 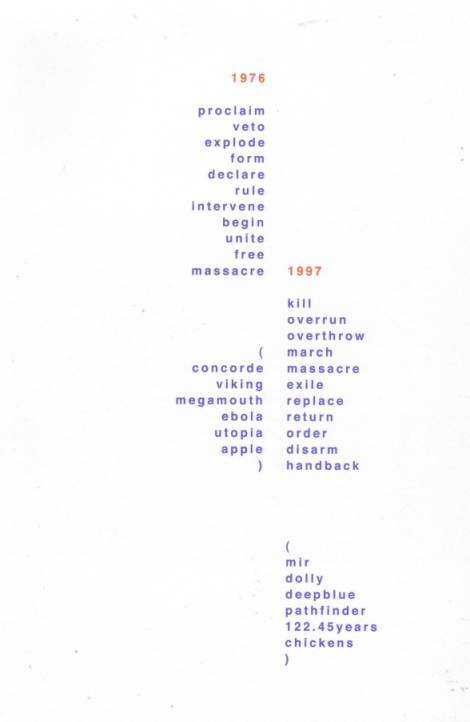 In a ’21 Years’ we have groups of words collected under two headings representing a 21 year period. The words are taken out of context and we can perhaps wonder at their source. Each word conveys a meaning obviously different to the one it had in the context of the original documentation if its time. Indeed words such as “explode”, “massacre’, “overthrow” and ‘ebola” probably elicit a different response now than when the exhibition opened in July. While actual Microscope Project exhibition may now be packed up in storage waiting for the next opportunity – an instate tour or an South Australian encore – I sense that I have once again been staring down the eyepiece of my ancient ‘toy’ microscope, fiddling with the focus and the reflected light, examining slides one by one. The documentation that accompanied this exhibition stands in its own right as an impressive cultural document. It is to be hoped that the exhibition itself can once again locate a light path and find a new audience. Mark Roberts is a Sydney based writer and critic. He currently edits Rochford Street Review and P76 Magazine. He also has a number of manuscripts looking for a publisher. (http://rochfordstreetpress.wordpress.com/p76-literary-magazine/). Rochford Street Review relies on donations to cover costs. Any funds left over are used to pay reviews.